Released in 2013, this is the first issue in the Hummel line . Merry Wanderer is 12 inches tall and made of the finest felt, with hand painted features. 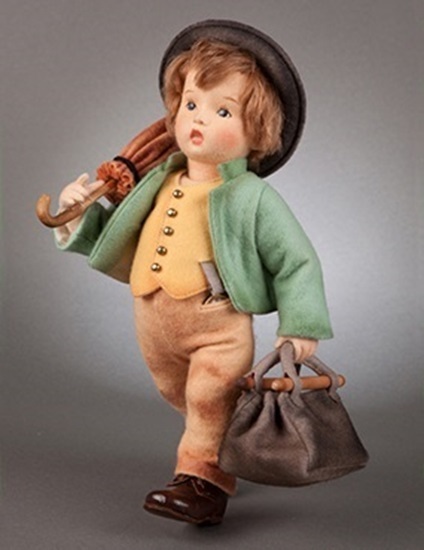 First in the line of the Hummel series by R John Wright, The "Merry Wanderer" is one of the most iconic figures in Hummel collections. Made for the first time in the felt medium, The Merry Wanderer is fully jointed with the RJW ball & socket system with internal wood mechanism. Standing approximately 12" tall, The Merry Wanderer has a distinctive custom face mold, delicately hand painted features, and a wig of the finest mohair. The expressive hands have individually-sewn fingers and molded sculptural details. The Merry Wanderer comes costumed in his all-felt 3-piece suit as shown in the illustration above with a molded felt bowler hat and umbrella. His entire outfit has been artistically shaded to evoke the original Hummel coloring exactly. Sturdy hand-cobbled leather shoes and a felt and alpaca carpet bag with wood rails complete his trademark ensemble. As a final perfect touch, in the tiny pocket of his trousers there is a custom-made RJW pocket watch made of brass with a glass lens! Every detail has been meticulously researched to insure that this is the finest and most authentic Hummel® doll ever made. One of a limited edition of 250 pieces, he comes with a signed certificate of authenticity.